1. the facade looks very japanese: clean, simple, quiet, with bamboo and stone flanking the door. inside they have three private rooms, each one seating from six to 10 people. this one has a very modern design with furniture we imagine would look better in a condominium model unit. 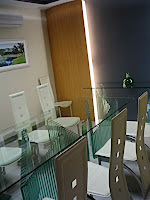 then there's the sushi bar, which can seat up to 10 people comfortably. we sat here. 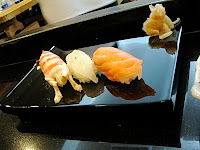 2. the items on the menu don't come cheap and for this dinner, we ordered sushi and sashimi dishes. each plate cost about P700 each, and our bill came to nearly P4,000 pesos—and that's for two people! (including a beer each, poured into a chilled copper mug.) but everything was super fresh, beautifully presented, and mmm delicious. 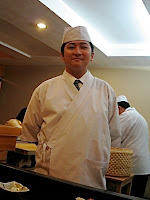 3. this is shintaro, the young sushi chef who used to work in ben kay. he's pure japanese, but be careful—he speaks tagalog! he's very friendly and quite engaging, he'll recommend dishes according to your budget. but because he was standing so close and wouldn't leave, we felt he was eavesdropping on our conversation, even nodding his head every now then. er, don't you have vegetables to chop or something? the waitstaff was very attentive and we have to say, TOO attentive. as dessert comes first says, the "server [must] intuitively understand[s] the dance of serve and retreat that must be adjusted to each customer..." and these guys need more training when it comes to that. 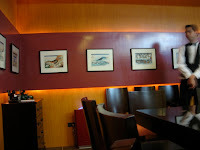 we were five customers that evening, and we EACH had a server hovering over us, eager to take plates and glasses away. it was not a relaxed atmosphere. it was almost like they wanted us to finish asap so they could... go home? 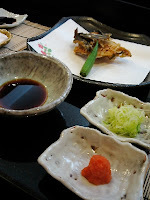 I grew up eating Japanese food, being that my family once owned a popular and respected chain of Japanese restaurants. I even worked in the company for over 5 years before venturing into my own (non-Japanese) restaurant. I have to say that Kobikicho makes every other local Japanese restaurant pale in comparison (yes, even Inagiku and Tsumura are no match). 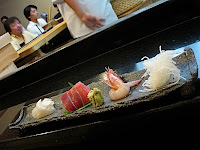 They serve only the freshest sushi and sashimi, of seafood that's caught in the wild rather than the farmed variety. I've eaten there twice and have been impressed each time. True, the bill comes as a bit of a shock, but in retrospect, this is only proper. It's still way cheaper than flying to Japan and/or eating stuff of this quality over there. It's the ultimate in freshness and quality, there has be a price to pay. BTW, here's something I learned the second time I visited--this resto is co-owned by Bayani Agbayani of the ocho-ocho fame, so don't be surprised to find some local showbiz folk in there. i ate here twice and both blue my mind and my wallet. many firsts (first time seeing wasabi being squeezed out of a root, salmon sashimi that had one color of orange, a katsudon with no fat and quite tender--its like eating snitzel, seabass like gindara and of course, toothpicks with groove.. plus shintaro, the uber friendly pinoy talking jap hovering over your meal.... not for the faint hearted but lots of fun. its nice to eat japanese food in KOBIKICHO,,,I would like to greet your beautiful head waitress named Gladys,,,,she's nice in dealing with people,,,aja!KOBIKICHO!!! 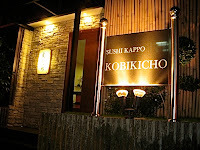 Moshi... i really really love the food at kobikicho, expensive but worth it!!! !